OK, first of all it was important to find remote controlled outlets (in short "RCO") that were suitable for our project, as building our own would have posed a lot of problems and cost lots of money. So we were fortunate by googling a little bit, to find a brand that was perfect for our needs: They were affordable, had a version for in- and out-door use and had individual dip-switch-programmable codes. The first problem solved, assembling the hardware was quite easy - as there was already a lot of knowledge from building the IPM. 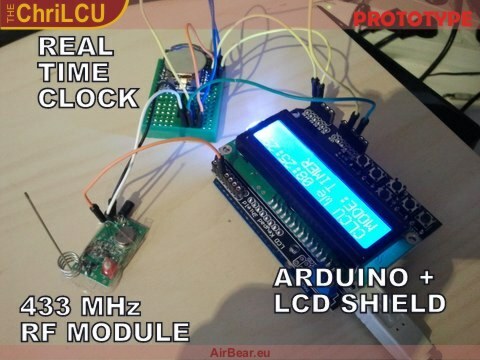 The prototype consisted of the following components: the arduino, an LCD-shield, a real-time-clock, and the RF transmitter (which allowed us to extend the range compared to the standard remote control). The only component missing in this picture is the light sensor, but connecting that component was no problem at all.